I have been busy getting everything ready for our paddling season at the new paddling center, so I haven’t had time to post anything in the blog. This morning I woke up early and decided to go out with the camera. I went to the Kallahti Peninsula (Kallahdenniemi in Finnish) to take some pictures of the sunrise. It was a beautiful morning. Next week I will try to write something about our new paddling center. 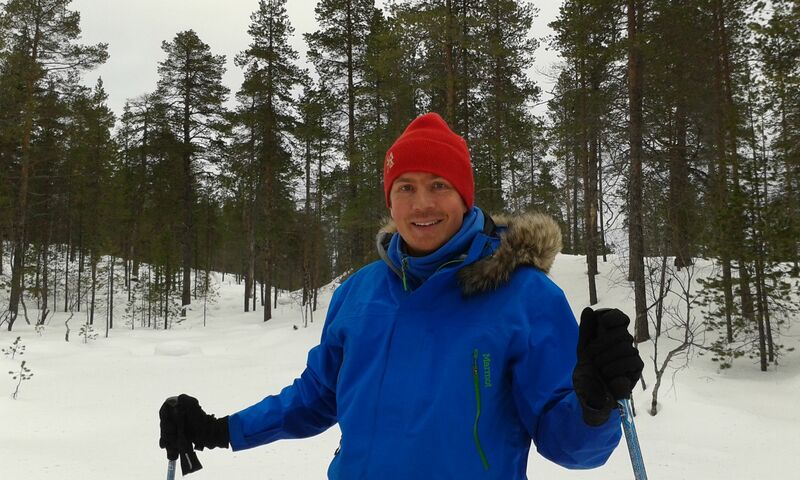 I made a short escape to Lapland one more time this spring! I am heading back to Helsinki on Wednesday. At the moment, I am just enjoying Lapland from behind of my laptop, but we managed to sneak out a little bit during the weekend. On Saturday we headed to Tankavaara to see the local reindeer competion. We also visited the Gold Prospector Museum. I really recommend visiting it if you are passing by! On Sunday we drove just 15 minutes from Sodankylä. Our aim was to visit Hirviäkuru, a beautiful gorge in the area. We were able to drive close to the starting place, although, the road conditions weren’t the best. We put on our snowshoes and started in the right direction. With my first step I went knee-deep through the snow. And it didn’t get much better later on. While pulling myself out of the snow, my snowshoes loosened and fell off several times. We descended down to the gorge. It was pretty steep, but amazingly someone had driven a snowmobile down the same way. The gorge was really beautiful and it is certainly worth a visit, if you are in Sodankylä. You can get really close in the summer, when the forestry roads are all open. We started really late and only got back to the car around 8 pm. Luckily the days are already so long. Now this is really going to be my last post with winter and snow pictures! I was guiding a week of hiking in Tenerife and once I got back to Finland, I have just been running around everywhere. Our new paddling center here in Helsinki is opening first of May and there is still a lot to do before that! Here are some pictures from Tenerife. It was a great week and a great group. Also a big thanks to our local partner Teno Activo and our guide Nayra for making everything work! On our first day we hiked in the La Orotava valley. And we also visited the city of La Orotava. It is a beautiful place! The Masca canyon was great as usual. It rained a bit at the start, but eventually the weather was really good! You could spend a week just hiking in the Anaga peninsula! There was still snow up on Teide and Pico Viejo. On our last day we hiked from Arona to Ifonche and visited Bodegas Reveron to taste the local wines. We stayed in Puerto de la Cruz and the sunsets there are spectacular! It was great to be a week in Tenerife, but now I am looking forward to start the kayaking season for real!